This page contains pictures that are not work safe and are considered 'adult' in nature. By continuing you acknowledge that you understand. 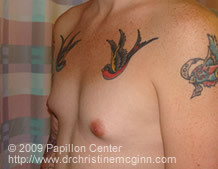 Breast augmentation increases the size and fullness of breasts through prosthesis: either Silicone or Saline implants. Dr. Christine McGinn, D.O. performs Breast Augmentation through a variety of techniques which are suited to the individual patient. Transgender Breast Augmentation has important unique differences from natal female breast augmentation. These differences will be discussed with you at your consultation in order to aid you in deciding which implant type and surgical approach is best for you. 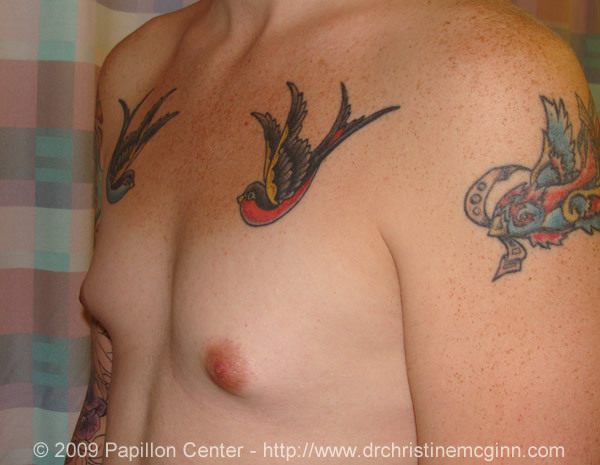 Dr. McGinn performs Aumentation Mammoplasty as well as corrective procedures from previous breast surgery on both natal and transgender women. Papillon Center requires all patients to not smoke for one month prior to any surgery and to remain in the New Hope area for two days following breast augmentation. Click to Enlarge Pictures. Pre-operative pictures are to the left, post-operative pictures are to the right.